Click here to go to lessons. 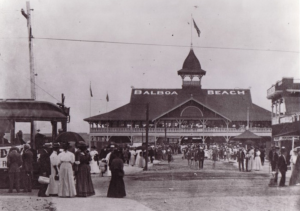 Balboa as a dance originated in the late 1920 in the Balboa Pavilion on the Balboa Peninsula in Southern California. At that time swing dancing was very popular and as the ballrooms became crowded management asked the dancers to not move away from their partners anymore and minimize movement to fit more people in the room. Since that time Balboa evolved and we now distinguish two types of Balboa: Pure Balboa and Bal-Swing. Pure Balboa is a closed embrace dance while Bal-Swing is a much more open dance. Balboa is typically danced to faster swing music (~160 BPM and up).